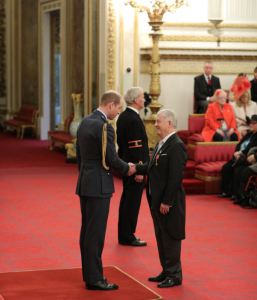 Dr Ian Clements, the Chair of the Health and Social Care Board (HSCB), received an OBE for ‘Services to Healthcare and the Community in Newtownards’ at an investiture ceremony held at Buckingham Palace on Tuesday 5 February 2019. Dr Clements has worked in Health and Social Care for 40 years during which time he has made a significant contribution to patient care both as a GP and as a Commissioner of Services. Ian received his award from the Duke of Cambridge in front of his wife Joanne, daughter Suzanne and sons, Richard, Alastair, and youngest son David who had flown in from Australia to join the family. “It was a very exciting and special couple of days, especially to have all the family together,” said Dr Clements, who was appointed Chair of the Health and Social Care Board in 2008. “It’s quite a big occasion, even just walking into the Palace, but all of the officials went out of their way to make us all feel welcome and at ease. Born and raised in Belfast, Ian attended Belfast Royal Academy and progressed to Queen’s University Belfast where he qualified in medicine in 1971. Following periods working in England and South Africa, he returned to Northern Ireland in 1981 to work as a GP principle in Newtownards. During that time he also provided GP services to young people in the Rathgael centre. Throughout his career, Dr Clements has had a strong interest in the development of service provision to expand and improve services for patients. While involved with the Northern Ireland Association for Mental Health, he helped set up a ‘Beacon Centre’ in Ards which, 30 years on, is still providing vital support for those experiencing mental health problems. “The Duke of Cambridge asked me about Beacon House and we talked briefly about the importance of supporting mental health services especially in the community” he said. Ian has held a wide range of professional posts in which he has been instrumental in developing the role of Primary Care and improving services for patients. These include: Chair of the Eastern Multi-fund; Chair of Eastern Health and Social Service Board GP Forum; Chair of the Eastern Local Medical Committee. He was also a member of the NI General Practitioners Committee. Dr Clements has also made a significant contribution to the development of GP wards in the Ards and Bangor Community Hospitals to provide appropriate, high quality care for patients outside of the acute hospital setting. These and other initiatives are now widely recognised as best practice as they enable patients to be managed effectively in the most appropriate setting. Dr Clements finished by adding: “I would like to accept this honour on behalf of everyone in the HSCB and across the HSC, Primary, Secondary and Community Care, that I have had the pleasure to work with for nearly 40 years. “It is their tireless effort and commitment that has ensured steady and continuing improvement in patient care,” he said.